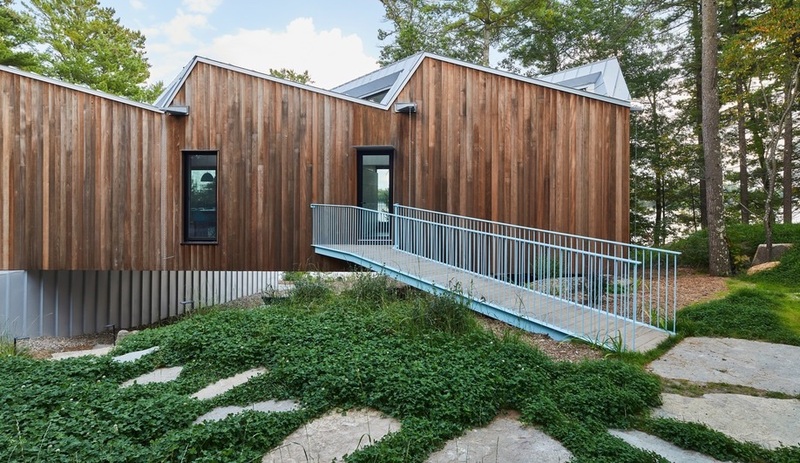 Former Herzog & de Meuron architects Julia Jamrozik and Coryn Kempster added unique character to this Net Zero house in Ontario with a sawtooth roofline and vibrant pops of colour. 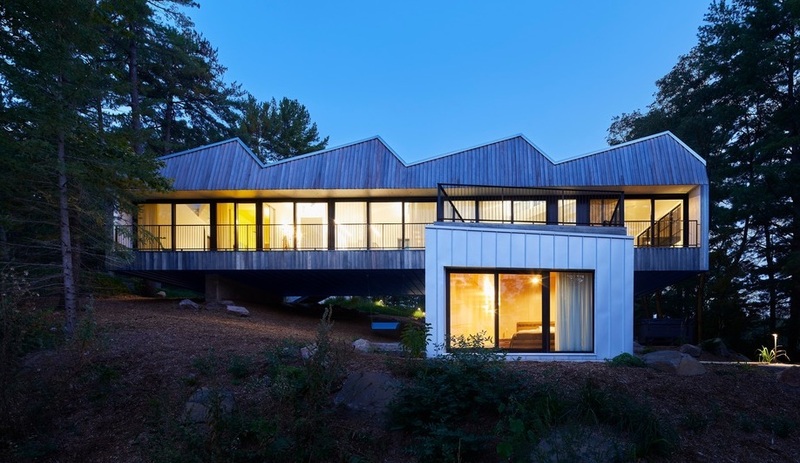 A pair of Canadian architects who formerly worked with Herzog & de Meuron have collaborated on a zero energy home in Ontario’s Kawartha lakes region. 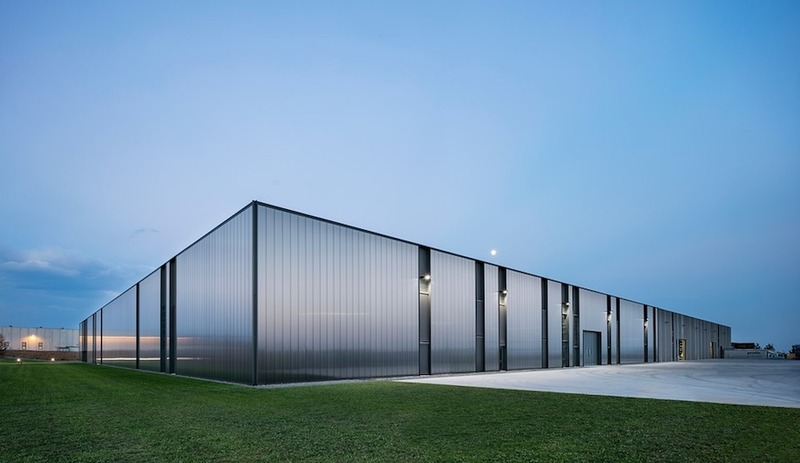 Julia Jamrozik and Coryn Kempster worked together at the Swiss firm, before taking on academic positions in the Department of Architecture at the University at Buffalo SUNY. 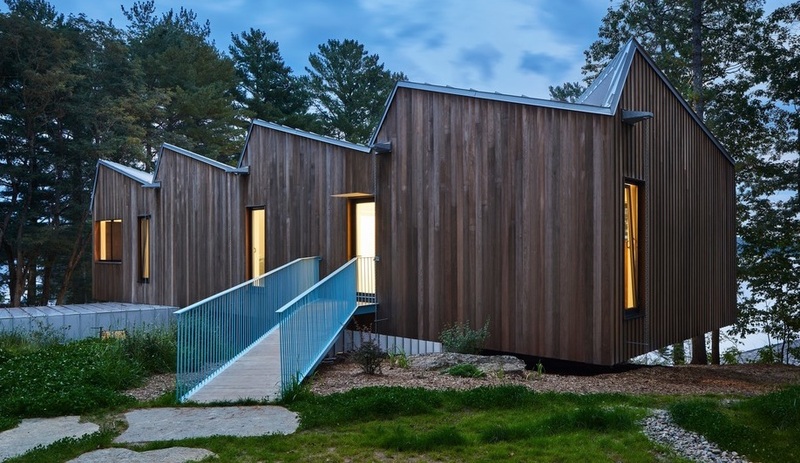 Sky House, the architects’ most recent project, is a 3,100-square-foot home on Stoney Lake that has been carefully plotted to work with the natural landscape. 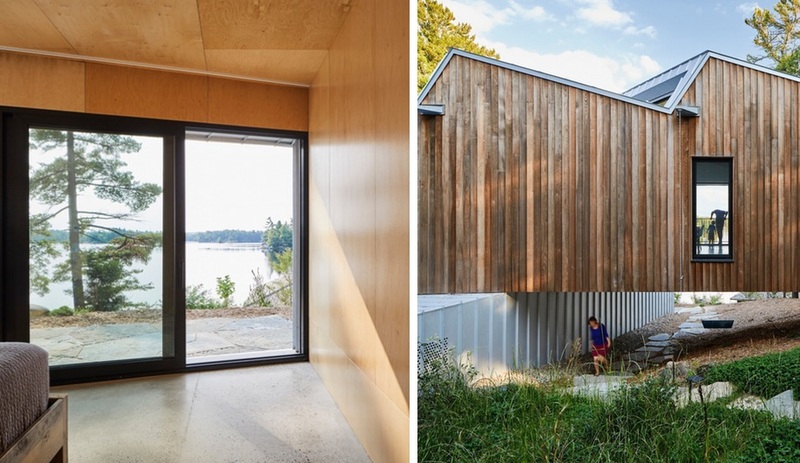 The stacked, two-storey volume was designed to avoid any disruption to the bedrock, or levelling of the steep lakeside site, as well as to leave the land’s old growth trees intact. 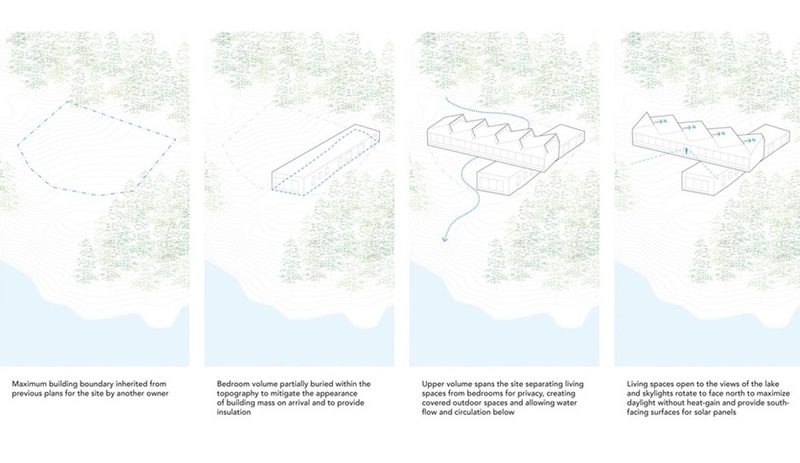 By backing the lower volume partially into the terrain, the architects both minimize the house’s visual impact on the picturesque landscape, and provide the walls with natural insulation. 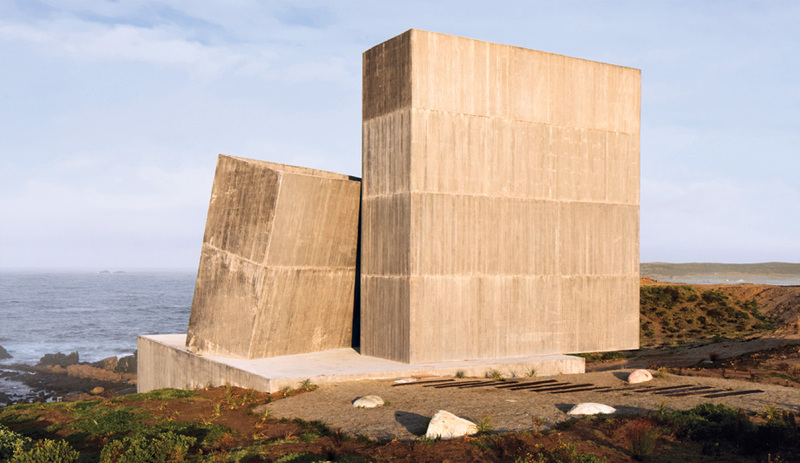 The more visible upper level angles over this lower strip, supported partially by the lower mass, and stretching across a dip in the site to rest on a concrete pier at the other end. Below this bridge-like section a covered outdoor space is created; complemented with a powder coated steel swing, it’s perfect shaded spot to enjoy the natural view. Clad in a responsibly harvested pine that has been thermally treated to improve the wood’s durability without chemicals, the main structure’s facade is defined by a jagged sawtooth roofline. 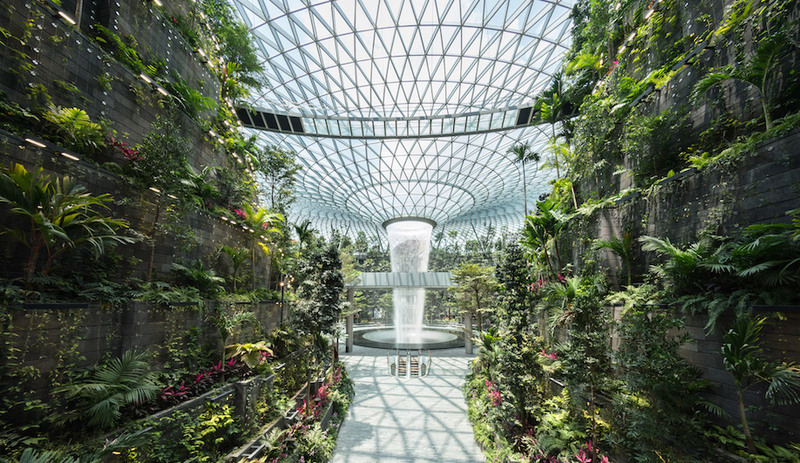 This distinctive feature allows a series of vertical skylights a northern exposure that lets daylight inside, while avoiding significant heat gain. Opposite the windows on each of the roof’s “teeth,” photovoltaic panels are angles southward to maximize energy production. Floor-to-ceiling windows in the open concept living area below work with these clerestory windows to fill the interior with daylight and provide natural ventilation. 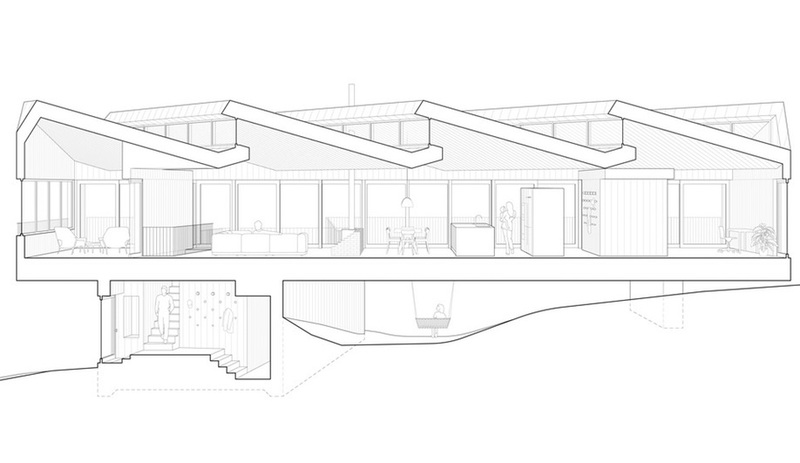 Standing a metre behind the roofline, these glass walls help minimize heat gain from the high summer sun. In winter, the lower sun provides passive solar heating when it washes into the room and is absorbed by the dark floors. 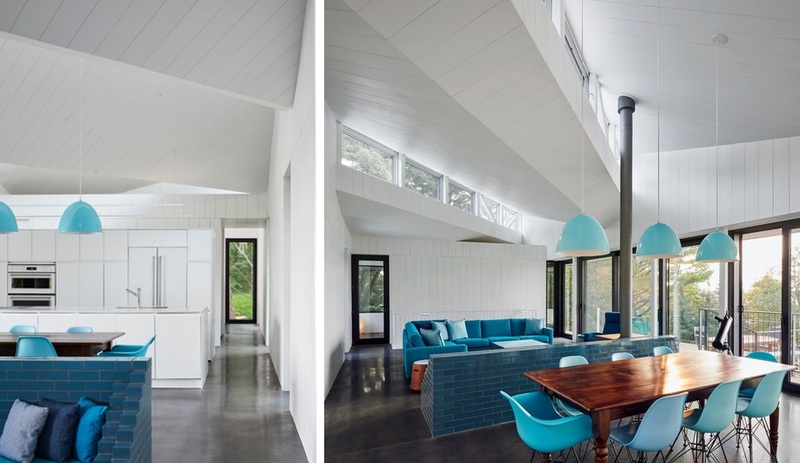 Jamrozik and Kempster also incorporated radiant heating within the concrete flooring throughout the house. The shared living spaces are all positioned on the upper level, and provide sweeping views of the lake, while the bedrooms below are less open, offering more privacy. Guests with disabilities are comfortably accommodated with an office/bedroom and accessible washroom at the far end of the main floor. The architects used formaldehyde-free plywood – left natural or painted white – for most of the interior walls. 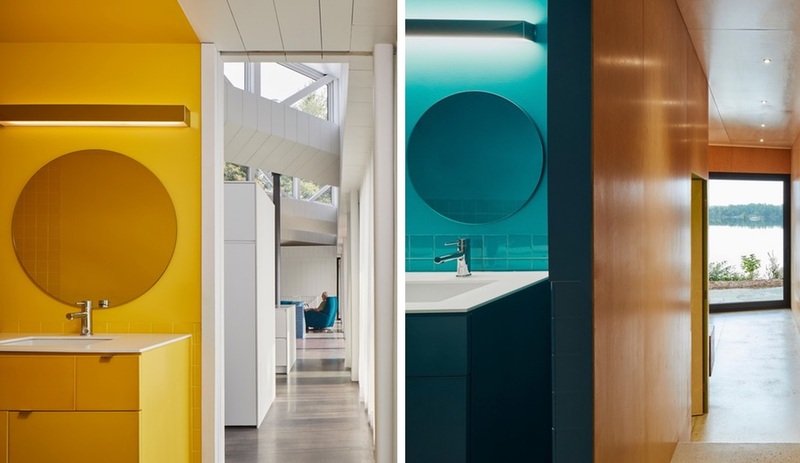 But blasts of colour mix things up in the bathrooms and the main living space, where the sofa, lighting and dining rooms chairs are in various shades of robin’s egg blue. 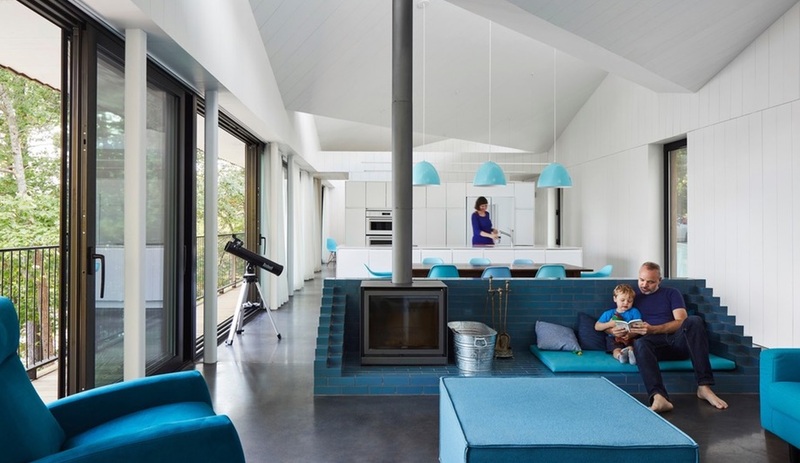 The focal point of this open-concept space is the hearth, which places a high-efficiency wood stove atop a blue glazed brick plinth. The brick adds to the effectiveness of the stove by acting as a thermal mass, and it also build in a cozy seating area. The stove provides extra heat during the colder months, and acts as a back-up for when solar resources run low. Speaking of solar, this Net Zero house also packs a Tesla Powerwall battery that stores the energy collected by the PV panel array, which produces enough green power to run heat, hot water and all the home’s appliances. While the windows are sufficient in the warmer months, an energy recovery ventilation system supplies the house with fresh air during the winter. 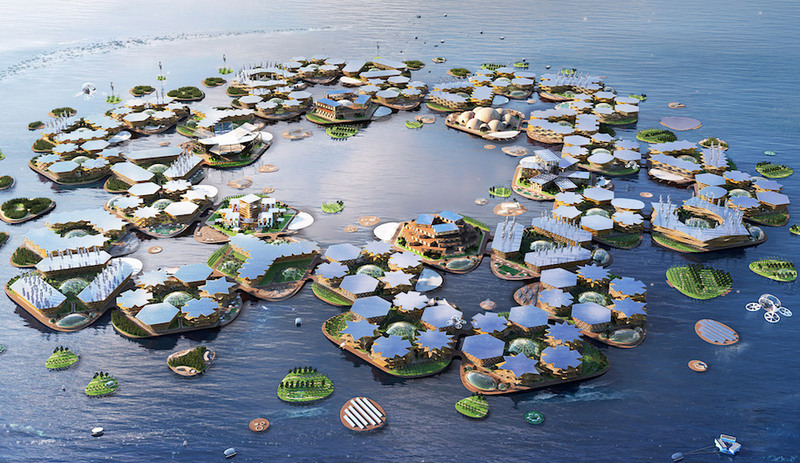 And the home’s H20 is drawn directly from the adjacent lake, with a system that uses UV light and filters to purify and clean the water, rather than chemicals.